Had to take a break from applique cord on the christening gown and decided to stitch down the silk ribbon ties for this sweet bonnet. It is a UFO from a SAGA convention over 10 years ago. 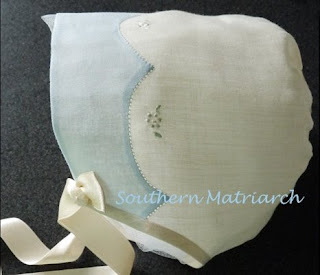 On the Heirloom Smocking and Sewing Forum of Delphi we had a sew up your stash challenge that went for 3 months. I finished up this project for that challenge. I need external motivation to get things done. 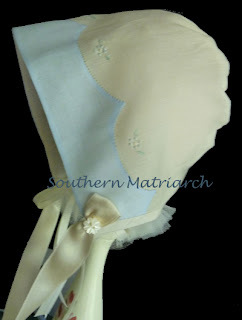 This little bonnet is made from Swiss batiste and has a Madeira applique hem, granito flowers and a tiny bit of applique cord done as an embellishment on the front. 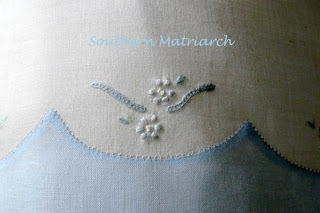 I actually chose that as a practice for the applique cord on this gown. It had been quite a while since I had done it and didn't want to practice on the gown. As always, click on the picture to make them larger. Not the best pics, I was in a hurry. I have always loved that bonnet.... sigh. Good to see ya back! What a precious little piece of confection!!! Your work is impeccable as always!! That's such an adorable bonnet. I love the colors!